The ‘Sri Lankan of the Year’ awards held on Friday were designed as an exhaustive, rigorous and credible platform to recognise and honour individuals and groups whose dedication, commitment, efforts and achievements in their chosen fields have far reaching influence on the country, positively impacting the local community and helping to profile Sri Lanka among the international community. Winners were nominated across multiple categories such as Sports, Unsung Hero, Global Entertainer, Entertainer, Global Scientist, Entrepreneur, and Global Businessman. 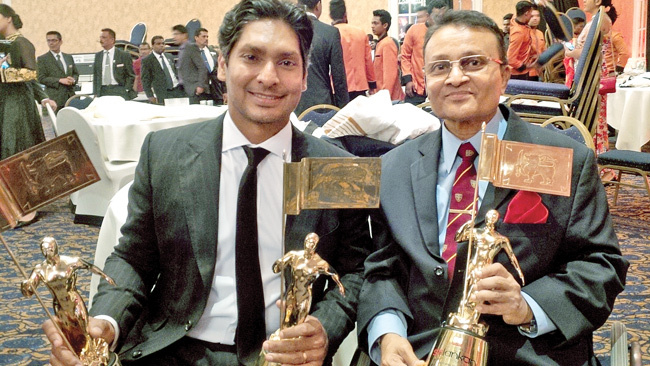 Sri Lankan cricket legend Kumar Sangakkara was adjudged the ‘Icon of Sri Lanka 2016’. He also won the ‘most popular Sri Lankan’ award selected by the SMS voting. Dr. Ajith C. S. Perera was adjudged the unanimous undisputed winner as ‘The Unsung Hero’. Dr. Perera playing eight different roles over 17 consecutive years in a voluntary mission of national importance, is the pioneer to open the road to rights for all. He is also the pioneer activist towards establishing Accessible Tourism for all. “In this country with over 20 percent of the population experiencing restricted ability, amazingly it was perhaps only the first time ever that a person with a dis-Ability and confined to a wheelchair for life was befittingly recognised for ‘Ability within dis-Ability’ and appreciated for his outstanding achievements and significant voluntary contributions to this country and its people”Dr.Perera said after receiving the award. It was mentioned here that: “it was an honour received by Dr. Perera not in any way on sympathy but purely on merit and earned with unreserved commitment to the promotion of accessibility to the built environment and thereby to the enhancement of the quality of everyday life of all persons with the widest possible range of abilities”. Each and every winner had been adjudged through a two tiered robust and transparent selection procedure by a jury of eminent personalities of distinguished stature that included Professor Carlo Fonseka, Deshamanya Professor J. B. Dissanayaka, Deshamanya Dr. Radhika Coomaraswamy, business icon Dayan Gomes and science writer par excellence Mr Nalaka Gunewardene in collaboration with industry / category specialists. This award I dedicate as a tribute to the ABILITY within the disability of all.” – Dr. Ajith C. S. Perera said, when presented with this award by Mr. Nalaka Gunawardena and Mr. Dayan Gomes.